Today’s Nice Price or Crack Pipe Subie WRX is claimed by its seller to be a show car. We’ll have to decide if that includes a price that’s asking you to show me the money! Okay, so things are pretty much up in the air globally, what with the Republicans rubbing their clammy hands together after Tuesday’s U.S. elections and pondering which one of Obama’s accomplishments to dismantle first. That doesn’t mean however, that there still isn’t some good in the world, and as evidence of that yesterday’s Herbie Goes to Monte Carlo homage 1976 Lancia Scorpion won a decisive 84% Nice Price win. I smell a mandate! Actually, “Man-dates” is a euphemism for testicles and I don’t really want to smell any of those. I don’t really care how much Febreze® you use on them. I mention balls because they are round and aesthetically unpleasing just like the headlights once were on today’s 2002 Subaru Impreza WRX. I say “were” because someone has gone ahead and de-bugged this Blaze Yellow WRX’s eyes. That was apparently part of an extensive bit of body kit that also includes everything below the waist and a hood with more scoops than 31 Flavors. Ah, and then there’s the doors. You might expect that this custom Subie might have Lambo (Hassan Chop style) doors up front, but would you have expected a boot lid that acts in a similar fashion? I think not, and yet this one does. On to the interior! If you like extra gauges, this car’s got ‘em. They are festooned to the A-pillar, the steering column, and an odd lone survivor atop a mid-dash cap wart that defies identification. If your fetish instead leans toward speakers then this car has you covered as well. Sparco seats and tiller spruce things up further, while carbon fiber trim ensures some of the surfaces in there are of the easy to clean variety. Mechanically, well these cars came with a turbo-imbued edition of Subie’s 2.0 boxer four so there you go. I think that one was denoted as the EJ205, and was named after EJ Dionne, the award-winning Washington Post columnist. Okay, I’m kidding about it being named after a liberal political writer, but there’s no joking about the long list of upgrades and updates with which this WRX has been embiggened. You can read the list in the ad, as I’m not about to transcribe it here. I will note though, the inclusion of Nitrous since that’s laughing gas and I think we all could use a good laugh these days. Mileage is a minimal 35K and the car comes with a clean title. The seller says that it’s a “Show Car” and that it has never seen snow or salt. 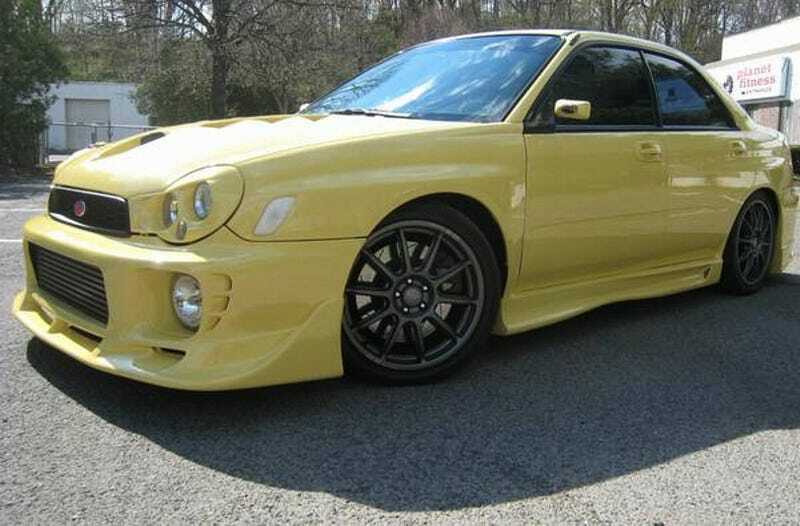 His asking price is $12,900 and it’s now your duty to vote on that price in determination of whether or not it’s a fair amount for this not so mellow yellow WRX. Fairfield New York Craigslist, or go here if the ad disappears. H/T to NoBo89 for the hookup!